It’s Animated Comic Strip Friday. You can find more here. Honestly, you can’t go wrong with anything from Really Right Stuff. But their new BH-40 Ballhead is that piece of equipment that makes you question why you struggled for so long with that other inferior tripod head you had. It is their mid-sized ballhead and is perfect for popular light to mid-sized gear such as 70-200mm/f2.8 and 300mm/f4 lenses. This ballhead is load-rated at 18-pounds but weighs only 13-ounces. For those of you who may not know, B&H is pretty much where all the professionals go for their equipment needs. They have everything, and normally at the best price. There are only two places I purchase my dSLR gear, and that’s Amazon and B&H Photo. Great sites, with great prices, without the hassle. Thanksgiving is my favorite Holiday. It’s a time to create a large and wonderful meal to share with your Family and Friends. Let today be the day that you take a little extra time and appreciate those around you. And while you’re at it, snap a few photographs of those around you. Today’s Holiday Photography Tip: When you look through the viewfinder, look at what’s behind your Loved One. If you don’t like the background, change your angle or move to the side. This is one way to move from a snapshot to a photograph. This will not only make the background clearer, but also help eliminate the akward piece of furniture sticking out the side of someone’s head. 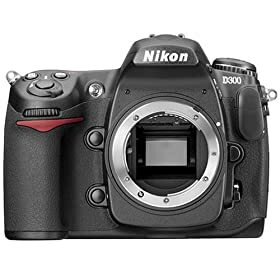 Amazon has the Nikon D300 DX 12.3MP Digital SLR Camera (Body Only) in stock and ready to ship. You can check it out here. Rob Galbraith has posted that Canon USA’s customer support is telling Canon EOS 40D customers that there will be an upcoming firmware update. the update is expected to improve incompatibility between CR2 RAW files and Adobe’s Camera Raw plug-in. Expect v1.0.5 firmware to be released the end of November.